Isa is the half-month stave through 13 December. Jera is the intuitive stave, and Ansuz indicates the Rune’s message to us. Read right to left is Isa, Jera, then Ansuz. At least it’s all right-side up this time. Am I wrong? For the last three weeks we’ve been inundated with our own needs, probably to a shocking and annoying degree. The hope with the progression from Hagalaz to Nauthiz is clarity in how to identify and plot a course for dealing with them. Isa is the finish line. Isa is the final of the winter trio. This runic microcycle starts the second aett, and it doesn’t play. Why would it? In the Old Norse culture winter was lethal. It was psychologically challenging, taxing of resources, and probably a introvert’s nightmare. The glory of Isa is that it’s the last, yet it’s probably the one that causes the more tension. A phrase associated with Isa is “ring not pass,” meaning, if we imagine progression through something as a sequence of closed rings with ourselves in the center, and we can’t progress to the next ring out until we master what’s in the present one… Yep. We don’t get to move forward with/through Isa until whatever the need that Hagalaz dredged up and the Nauthiz decision-making process honed in on are crystal clear. Jera suggests this stillness may take some inventorying, some organizing, and calculation. 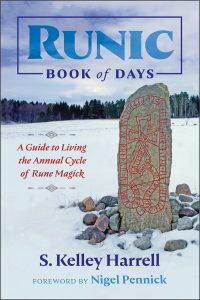 The rune meaning “year,” it brings up dynamics of taking stock, thus formulating plans around the assessment. Given that it’s exalting Isa, there’s no indication to move on those plans. It’s purely an opportunity to realize the potential of what can come of the current needs examination. The one thing we’re reminded to do in that process is to tell the truth about it. 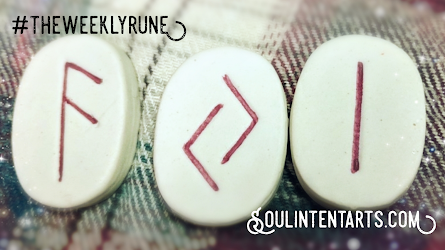 Ansuz is the rune of speaking, and this week it is the voice of Logic. I know–I did a double-take, too. That’s never happened before, and at first I wasn’t sure what to make of it. Anytime logic comes up in intuitive things, I get eyerolls from both sides. In this case, it makes no sense to go through this grueling needs-revelation process and continue lying to self. Do we have to scream our truth from the rooftop? Maybe. Or maybe it’s enough for now to let it be known to self, and let it gel into wisdom.